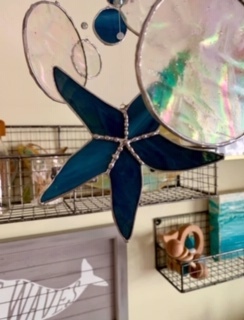 Stained Glass 101: Students will learn about the materials and tools used in stained glass as well basic procedures for creating stained glass suncatchers. Each student will create and take home one suncatcher (templates, materials, and tools will be provided). Each glass component will be pre-cut and pre-ground; students will select glass, foil wrap, and solder their pieces together. Introduction to stained glass; no experience necessary. I recommend wearing clothes you don’t mind getting dirty, close-toed shoes, and hair tied back.